As you might imagine, I brought back quite a haul of beer from #NewYork. The combination of more availability, cheaper prices and very generous customs allowances was a triple threat that made my suitcase very, very heavy for the way home. 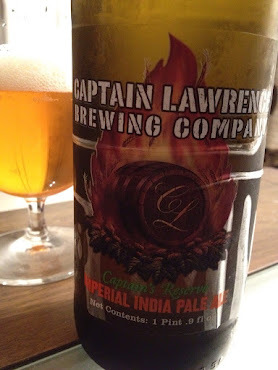 I brought back a range of styles from Barley Wines to Ameican Porters, but it's the pale, hoppy beers that were quickly crammed into my fridge in order to preserve that fresh hop character, with this, Captain Lawrence Captain's Reserve Imperial IPA (8% abv not stated in the bottle), being the first to make it into a glass - and what a beer to start with. This pours a perfect liquid gold with a pure white head. The aroma is unbelievably fresh - Clean, floral and fruity with a citrus fruit bowl of pith sitting alongside pure fresh pine. The flavour is just so clean and fresh the bitterness goes almost unnoticed on the first taste as a wash of citrus, sweet grapefruit and resinous pine fly past atop a magic carpet of perfectly crisp pale malt. It's a masterclass. In fact aroma bursts out so readily that as you swallow the hop aromatics rush up through your nasal passage and the effect is so dramatic that it actually made me sneeze. A happy first! There's a great depth of hop flavour too thanks to the range of 5 hops used, and the bitterness which is subtle at first builds up after a few sips to become full and drying in the finish. That said, it certainly doesn't have a punishing bitterness like some American IPA's, and is clean (there's that word again), balanced and moreished. I could drink this stuff all day. What a beer. I bought the majority of my beers from Good Beer in the East Village, a fantastic bottle shop come beer cafe.